The Free State of Thuringia (German: Freistaat Thüringen, is a state of Germany, located in the central part of the country. It is known as the "green heart of Germany", due to the dense forest that covers the terrain. It has an area of 16,171 square kilometers (6,243.7 sq mi) and 2.29 million inhabitants, making it the sixth smallest by area and the fifth smallest by population of Germany's sixteen states. The capital is Erfurt. From the Northwest going clockwise, Thuringia borders on the German states of Lower Saxony, Saxony-Anhalt, Saxony, Bavaria and Hesse. The ridges of the western Harz Mountains divide the region from Lower Saxony on the north-west, while the eastern Harz similarly separates Thuringia from the state of Saxony-Anhalt to the north-east. To the south and southwest, the Thuringian Forest effectively separates the ancient region of Franconia, now the northern part of Bavaria, from the rolling plains of most of Thuringia. The central Harz range extends southwards along the western side into the northwest corner of the Thuringian Forest region, making Thuringia a lowland basin of rolling plains nearly surrounded by ancient somewhat-difficult mountains. To the west across the mountains and south is the drainage basin of the Rhine River. The most conspicuous geographical feature of Thuringia is the Thuringian Forest, a mountain chain in the southwest. The Werra River, a tributary of the Weser River, separates this mountain chain from the volcanic Rhön Mountains, which are partially in Thuringia, Bavaria, and Hesse. In the northwest, Thuringia includes a small part of the Harz. The eastern part of Thuringia is generally a plain. The Saale River runs through these lowlands from south to north. The geographic center of the Federal Republic is located in Thuringia, near the municipality of Niederdorla. Enjoy a journey through the past and visit castles, palaces and ruins where history is prevalent throughout this German State. Thuringia's exciting cities offer an amazing variety to visitors. Johann Wolfgang von Goethe, Friedrich Schiller, Martin Luther and Johann Sebastian Bach are among many famous personalities from this region. City of Erfurt renowned as important center of trade and commerce and famous for skills and artistry of dyers. Horticulture is today's economic focus. Towns throughout this State offer visitors outstanding view of extremely well preserved medieval structures, historic old town centers and squares. This State is culmination of where great minds, romantic castles and modern life come together. 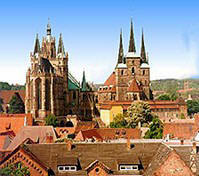 Erfurt is the capital city of the state of Thuringia (Thüringen) located in the "green heart of Germany". Erfurt was first recognized in 742 A. D. and has grown in the middle ages from being an important intersection of the old trading routes to become a powerful centre of the trading industries and an important university. Erfurt’s cultural, intellectual and economic strengths brought great personalities such as Luther (Augustinian monastery), Adam Ries, Goethe, Schiller, Herder, Wieland, Bach (Kaufmannskirche, the church where J. S. Bach’s parents were married), W. v. Humboldt, Zsar Alexander and Napoléon (Kaisersaal, Staatskanzlei). The former wealth of the city may be witnessed in the many carefully restored renaissance and half-timbered houses which, with many other buildings and the Krämerbrücke make up one of the best preserved historical city centres of medieval times in Germany. At one time the 36 parish churches and chapels as well as 15 monasteries and ecclesiastical foundations were responsible for Erfurt having been given the nicknames "Rome of Thuringia" and "erfordia turrita" (tower crowned Erfurt). 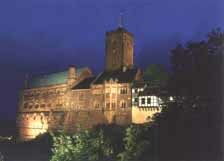 The capital city of Thuringia is without a doubt one of the most beautiful cities of Germany.